Round Dining Table With A Bevelled Glass Top. Table Features An Espresso Finish Base. Also Available(Sold Separately) Matching Microfiber Side Chairs. 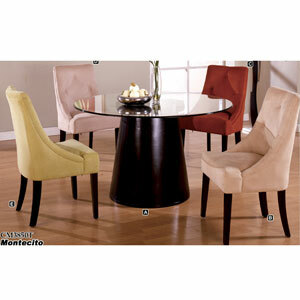 Side Chairs Comes In Four Different Colors, (B)Light Mocha, (C) Cognac, (D) Ivory And (E) Apple Martini. Chairs Can Come All One Color Or Mixed And Matched. Made Of Solid Hardwood And Veneer. Strong Construction. Easy To Assemble.